Since ADHD is common in the general population, health care providers caring for athletes should be aware of how treatments, including medications, can affect an athlete’s exercise performance. Since most medications for ADHD are stimulant based, they have common side effects. The American Medical Society for Sports Medicine addresses their concerns about these side effects in a position statement. Their concerns include: the increased risk of heat injury as stimulants increase core temperature and often mask signs of fatigue, appetite suppression which leads to difficult weight maintenance, the effects on the athlete’s cardiovascular system, and the possible risk of abuse. Frequent monitoring should take place to avoid progression of negative side effects. It should also be noted that stimulant medications are banned by the World Anti-Doping Agency and the International Olympic Committee due to their possible performance enhancing capabilities. The effect of stimulant ADHD medication on the cardiovascular system is important to understand, especially considering the relatively high number of athletes abusing stimulants for improved performance. Studies show that acute use of stimulant ADHD medication increases the resting, submaximal, and peak heart rates of users. According to some studies, ADHD medication also increases blood pressure. At the same time, these medications seem to lower perceived exertion. Combined with exercise, which also increases heart rate and blood pressure, these effects may place acute users at a higher risk for tachycardia-related adverse cardiovascular events, such as cardiac arrest or even sudden cardiac death. Although more research on the long-term cardiovascular effects of chronic stimulant ADHD medication is needed, a very recent study found that they might be very different from those of acute use. In a cross-sectional cohort study including 245 chronic stimulant ADHD medication users and 735 nonusers, researchers found a statistically significant relationship between chronic stimulant ADHD medication use and a decrease in exercise-induced peak heart rate. This decrease in peak heart rate was also associated with a higher risk of chronotropic incompetence, a condition where the heart is unable to beat at a high enough rate to keep up with the demands of increased exercise. Concerning non-stimulant ADHD medication, studies have shown that therapeutic doses of atomoxetine result in increased heart rate and blood pressure. In adults, an increase in systolic blood pressure was more common, whereas in children an increase in diastolic blood pressure was more likely to be observed. These changes occurred primarily within the first few weeks of treatment. With long term use (>1 year), many of these changes had stabilized. While there are valid concerns over the cardiac risks involved with both stimulant and non-stimulant drug use, no causal relationships have been established between therapeutic doses and serious cardiac events. However, caution should be taken in cases where the individual presents with pre-existing cardiac abnormalities. As physical therapists, it is essential to perform a thorough pretreatment assessment and monitor individuals while they are doing therapeutic exercises. During the initial assessment, the type and duration of medication should be disclosed, as this may help the therapist with interpreting cardiovascular changes that occur during treatment. For anyone involved in physical activity it is important to be aware of caloric intake and appetite. The adequate amount of calories must be consumed in order to have enough energy to perform day to day activities and exercise. A known side effect for most ADHD medications, including methylphenidate and dextoamphetamine-amphetamine salts, is decreased appetite. People who are taking ADHD medication may struggle with not being hungry, which could lead to an inadequate amount of calories consumed. This could become a hindrance to physical improvement and weight control when working with people with ADHD. Athletes who utilize ADHD medication must monitor their caloric intake and expenditure to guarantee they maintain enough energy to perform. Loss of appetite can become an issue for any age group, but there can be greater consequences for adolescents. However, side effects of appetite suppression and weight loss may be beneficial for obese adults. A loss of appetite for children can not only effect their ability to perform daily activities, but can also effect their growth. It has been shown that height can be reduced by 1 cm per year of consumption for the first 3 years. Weight can be 3 kg less than the expected weight for the first 3 years of consumption. These side effects can fluctuate depending on the type of medication. Children who consume ADHD medications should be monitored to ensure that they are getting proper nutrition and developing within normal ranges. One study found that women may experience more appetite suppression than men while taking methylphenidate (MP), especially obese women. These findings imply that adipose tissue plays an important role in MP medication response. Female hormones influence the effects of dopamine and serotonin in the brain, possibly accounting for the greater suppressive effect. The effects of lisdexamfetamine dimesylate (LDX) on appetite suppression has led to FDA approval for treatment of binge eating disorder (BED). LDX is the only medication approved to treat both BED and ADHD. The use of ADHD medications can help athletes in their performance. Studies show that some amphetamines can mask the fatigue felt during intense exercise. Fatigue is still experienced however, but the intensity of it is reduced. This allows for the athlete to perform at a higher level for an extended period of time with less resting time. Some researchers have found that when amphetamines were taken before an exercise there was a higher amount of lactate present in the body than what was previously tolerated without the ingestion of ADHD medication. These effects are important to note, considering the prevelance of overtraining and over exertion among athletes and other patients. Without accurate feedback from the body, a patient may not accurately communicate with the therapist about their limits during a session, or the patient may push themselves into a physiological zone of tissue injury/reinjury during rehabilitation. It becomes extremely important for a therapist to establish and communicate clear boundaries of the appropriate amount of exertion to promote recovery without incuring more damage. ADHD medications enhance the effect of dopamine on the body. This action will increase motor activity, which will increase muscular endurance  . These medications can also help reduce the feeling of fatigue while exercising . Muscle fatigue is caused by the buildup of lactate in the blood. Fatigue severely hinders the body's ability to exercise, especially after long periods of time. While taking ADHD medications, the body still experiences fatigue but there is a higher amount of tolerance to increasing blood lactate levels. Muscular endurance is a highly sought-after result of exercise, so naturally, ADHD medications are often used inappropriately. An excess of these stimulant-type drugs may increase the occurrence of tremors and myoclonus in muscle tissue  . These irregular involuntary muscle contractions increase the risk of injury during any type of movement. The ability to exercise efficiently and with correct form is reduced due to the unpredictable muscle contractions. Another neural effect of ADHD medications has been observed in older adults. It is shown to reduce both the number of step errors and the rate of step errors, but caused no improvement in regards to stability. This can consequently cause a partial benefit to elder patients in physical therapy by increasing their performance, though it is important to note that balance should be monitored closely no matter the decline in error rate. Tics are treated in a variety of ways such as adjusting medications, behavioral therapy, and adopting healthy habits such as regular physical exercise. This is important information for physical therapists to know when treating patients who may have tics. Exercise programs can reap positive benefits, but patients with tics will have physical limitations and involuntary muscle movements that can make exercises difficult to complete and put them at risk for injury or falling. A physical exercise program will not heal the occurrence of tics from happening, but it can be supplemental in other treatment strategies. Although we have discussed ADHD medications and positive effects on muscle fatigue tolerance, a study on methylphenidate, a noradrenaline reuptake inhibitor, measured the effects of fatigue on well-trained males. Ten men went through a cycling exercise after methylphenidate consumption and were measured for fatigue. The results of the study showed that this type of ADHD medication can cause the body to fatigue more quickly when enduring prolonged exercise. This study showed that different ADHD medications definitely have an effect on exercise performance and muscle endurance. Therapists have to worry about fatigue when planning exercises for patients, so it is important to be familiar with the various effects of ADHD medications. A second issue to be aware of is that ADHD medications such as amphetamines may contribute to the development of pulmonary arterial hypertension (PAH). Amphetamine and stimulant use are associated with PAH . PAH is a rare disorder that results in elevated pulmonary vascular resistance and high blood pressure. The constricted arteries prevent adequate blood flow from your heart to the rest of your body. PAH also will produce symptoms such as shortness of breath, fatigue, dizziness, swelling in the limbs, etc. Physical therapists (PT) need to be aware of the medical history and medications that their patients are taking. If PT’s are aware that their patients have PAH, they can monitor them to make sure they do not overexert themselves and become injured or faint. If the patients are unaware they have PAH, their PT may be able to detect their condition based on their evaluation and refer them to a physician. ↑ McCabe S, West B. Medical and nonmedical use of prescription stimulants: results from a national multicohort study. J Am Acad Child Adolesc Psychiatry. 2013;52(12),1272-80. ↑ 2.0 2.1 2.2 Medical Information and Trusted Health Advice: Healthline. ADHD Medications List. http://www.healthline.com/health/adhd/medication-list#Overview1 (accessed 2 Dec 2015). ↑ Glaser P, Gerhardt G, Norvillitis J. 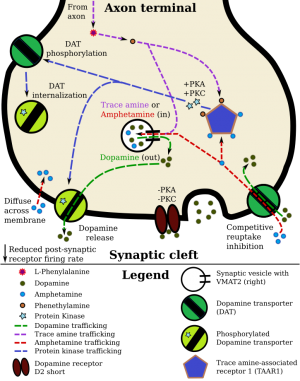 The neuropsychopharmacology of stimulants: dopamine and ADHD. In Current Directions in ADHD and Its Treatment. 2012;92-110. In Tech Open Access Publisher. ↑ 5.0 5.1 5.2 5.3 5.4 Putukian M, Kreher JB, Coppel DB, Glazer JL, McKeag DB, White RD. Attention deficit hyperactivity disorder and the athlete: an American Medical Society for Sports Medicine position statement. Clin J Sport Med. 2011;1(5):392-401. ↑ 14.0 14.1 Mercer M, Farver D. ADHD: monitoring for and managing stimulant adverse effects. S D Med. 2013;66(12):511. ↑ 15.0 15.1 Davis C, Fattore L, Kaplan AS, Carter JC, Levitan RD, Kennedy JL. The suppression of appetite and food consumption by methylphenidate: the moderating effects of gender and weight status in healthy adults. Int J Neuropsychopharmacol. 2012;15:181-7. ↑ McElroy SL, Guerdjikova AI, Mori N, Munoz MR, Keck PE. Overview of the treatment of binge eating disorder. CNS spectrums 2015;20(6):546-56. ↑ Chandler J, Blair S. The effect of amphetamines on selected physiological components related to athletic success. Med Sci Sports Exerc. 1980;1:65-89. ↑ 18.0 18.1 Enevoldson T. Recreational drugs and their neurological consequences. J Neurol Neurosurg Psychiatry. 2004;75(3):iii9-15. ↑ Chandler JV. The effect of amphetamines on selected physiological components related to athletic success [dissertation]. Ann Arbor: University of South Carolina. 1977. ↑ Rampello L, Alvano A, Battaglia G, Bruno V, Raffaele R, Nicoletti F. Tic disorders: from pathophysiology to treatment. J Neurol. 2006;253(1):1-15. Available from: http://web.b.ebscohost.com.webproxy.ouhsc.edu/ehost (Accessed 2 December 2015). ↑ 22.0 22.1 Cortese S, Holtmann M, Banaschewski T, Buitelaar J, Coghill D, Danckaerts M, et al. Practitioner review: current best practice in the management of adverse events during treatment with ADHD medications in children and adolescents. J Child Psychol Psychiatry. 2013;54(3):227–46. http://web.a.ebscohost.com.webproxy.ouhsc.edu/ehost (Accessed 2 Dec 2015). ↑ Klass, M., Roelands, B., Levenez, M., Fontenelle, V., Pattyn, N., Meeusen, R., & Ducateau, J. (2012). Effects of noradrenaline and dopamine on supraspinal fatigue in well-trained men. Medicine and Science in Sports and Exercise, 44(12), 2299-2308. 10.1249/MSS.0b013e318265f356.